Cure CF, Inc. is a Derby Festival charity for the second year. Team Cure CF, Inc has many members that will be running/walking on April 28th. We would love for you to join us or to help support us in reaching our goal! In early 2015, a small group of parents who didn’t know each other particularly well, decided to meet over a cold beer at a local brewery in Louisville, KY. The one thing we had in common… kids battling cystic fibrosis. That night the Klausings (Luke ­ 8 years old at the time), the Foushees (Alex ­ 2 years old at the time), the Sweeneys (Samuel ­ 8 months old at the time) and the Herzogs (Cameron 9 years old at the time) decided to work tirelessly to rally their city to join the fight to save their kids and beat CF once and for all. 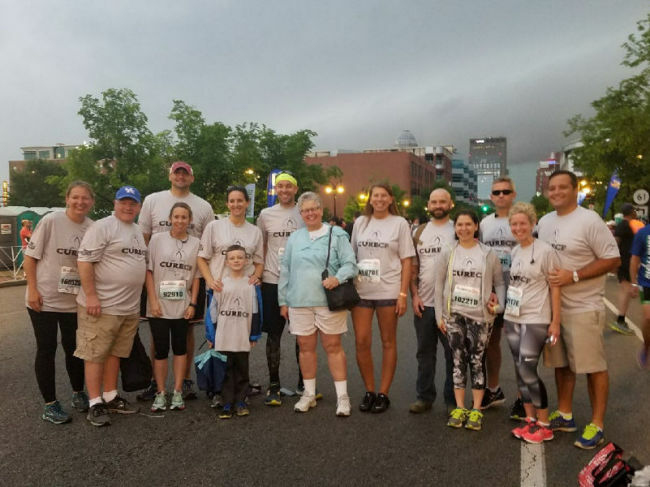 Cure CF, Inc. is 100% volunteer based: no employees, no salaries, no overhead; therefore, 100 % of all money raised goes to finding a cure for CF!